I am not much for making New Year’s resolutions. Never have been. I like to think that if I see a change that needs making, I try to make it regardless of the date on the calendar. That may or may not be true, but it’s what I like to think. But having just sorted the Christmas cards into piles – recyclable, throw-away, and a very few that I will keep and find next year or the year after, tucked away in the Christmas tree ornaments or wrapping paper – I think I should resolve to make more of an effort to reconnect with old friends in the new year. 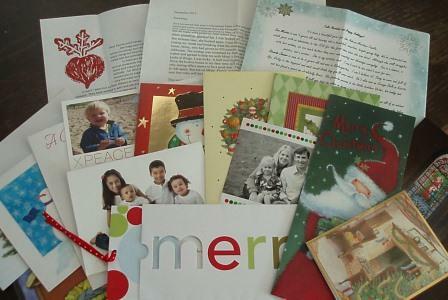 In an era when our mailboxes rarely contain more than bills and catalogs, the flurry of cards at the holidays is like a boon for the heart. Some are from people who live down the road, or down the Interstate, whom I see and speak with regularly. Many are from cousins and other relatives from all sides of the family. And some cards come from friends far away, bearing photos of faces from my past in their own versions of the present. Whether I’m opening a crisp envelope addressed in familiar handwriting, or sending my own cards to faraway places, I remember these friends from different stages of my life and the times we shared. I spent a good few years in my 20s wanderlusting from New England and Upstate New York to Europe and Colorado and Ireland and, finally, back to New England. I’ve left a piece of my heart in most of the places I’ve lived, and carry with me the friendships and memories from each stop along the way. So, while I love the life I’m in now, the sending and receiving of Christmas card greetings and photos makes me miss acutely the folks with whom I’ve shared some of my past. The now-California girl I spent a summer with hitchhiking around Ireland. The childhood buddy I dragged out to Colorado with me, who still lives there 15 years later. The friend I got to know and love on a spontaneous wilderness backpacking trip in Colorado. The former roommate who took me camping when my beat-up truck had a flat and I was desperate to sleep under the stars. The wonderfully fun women I played soccer with during my summer in Connemara. The friends I’ve worked with and skied with in various places. The high school pals who have grown along with me, becoming doctors, teachers, parents. Some of them I think of only occasionally. Others I miss nearly every day. It is easy in the busy-ness of raising kids, maintaining a career, and keeping a home to become content with an occasional brief email message, phone text, or Facebook post to keep in touch. But really those are sorry replacements for an actual conversation – whether over a coffee shop latte, a glass of wine, or on the phone. Our friendships, whether new, old, or rediscovered, make life richer in so many ways. And so I hope to reconnect with some old friends in the year to come – and make the time to create great memories with friends old and new. Here’s to a New Year prosperous in friends! It all does little to invoke the spirit of Christmas – joy, love, peace. As far as I can tell, the only folks trying to take the Christ out of Christmas are the large retailers who have quite effectively convinced us that the “Reason for the Season” is all about buying, with their piped holiday music starting in October, their Black Friday and Cyber Monday sales, their advertising aimed at persuading us that we must have the perfect, expensive, overly packaged gift for everyone we know and love. I’ll admit I think it’s a bit silly to call a Christmas tree a “holiday tree,” but I’ve never actually heard anyone say, “holiday tree” – other than the folks complaining about the term. 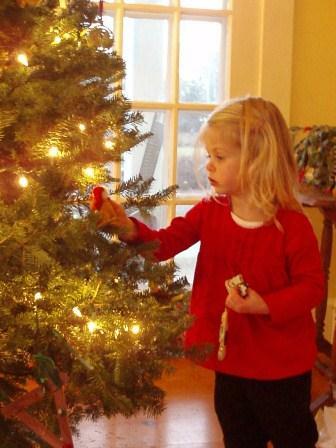 I write copy for a number of Christmas tree farm associations, and I’ve never written, nor been asked to write, “holiday tree.” And while decorated firs have been a Christmas tradition since the 1800s, Christmas trees have nothing to do with Christ. In fact, many argue the bright adornment of evergreen boughs in the dark of winter is a pagan tradition. As for Christmas being an American holiday, well, that’s simply not the case. Christmas was celebrated long before our country was founded, and it is celebrated around the world. It’s a Christian holiday, and last time I checked, the United States of America did not have a national religion. In fact the First Amendment of our Constitution guarantees free exercise of religion. Clearly, Christmas is celebrated in some form by the majority of Americans. That does not make it a national holiday any more than millions of American kids playing soccer makes that sport an American one. Now, onto the greeting of “Happy Holidays.” The reality is that there are several holidays happening this time of year. It starts with Thanksgiving (which IS an American holiday), moves on to Christmas – or Hanukkah or Kwanzaa or Festivus or whatever else people celebrate – then to New Year’s Eve. The greeting of “Happy Holidays” begins in November and covers you through New Year’s Day and beyond. In 1942, Bing Crosby crooned “Happy Holiday”, in a song that is still played ad nauseam during the season. I seriously doubt anyone got red in the face in 1942 about Bing not wishing people “Merry Christmas!” The song’s lyrics have nothing to do with Christ, and lots to do with Santa and presents. “Christmas” is there twice, “holiday” or “holidays” more than a dozen times. The point of the song – and of most any holiday greeting – is that it’s a happy time of year, one for wishing others well. I now watch Christmas unfold for my three small children, for whom the season is all about magic and snow, candy canes and Santa Claus, twinkling lights and jingle bells. My kids, of course, look forward to the presents of Christmas. But they also love helping make cookies to share with others, singing songs about dancing snowmen and flying reindeer, making and wrapping presents for people they love. They’re learning that, above all, the holidays are about being kind to others, doing nice things, inspiring joy. Kindness and finding magic in both the ordinary and extraordinary happenings of our world are at the core of the holiday spirit. It doesn’t matter if you wish others “Merry Christmas,” “Happy Hanukkah,” or “Fabulous Festivus.” The important thing is that you mean it, that you’re kind to others whether they celebrate the same holiday as you do or not. May we all find joy and wonder this season. Happy holidays!